Item is a photograph of Mary Rideout seated at her desk. Item is a photograph of Mary Rideout sorting prints. 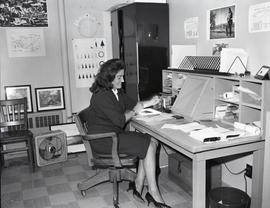 Item is a photograph of Mrs. Rideout filing photographs. 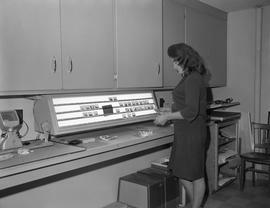 Item is a photograph of Mrs. Rideout sorting color slides. Item is a photograph of, from left to right, John Lunn, Larry Vachon, and Reg Glencross in the Administration Office.